Roller blinds offer simple operation for a stylish look. Suitable for commercial or domestic installation, the roller blind's flexibility meets the full range of needs, from blackout to highly decorative options. We offer a unique collection of roller blind fabrics comprising plain, printed designs, textured and jacquard weaves, dimout, blackout and fire retardant fabrics - solutions for all applications. Scallops, braids and trims are also available to finish off your roller blind. All component parts are fabric are enclosed within a round fascia resulting in a compact robust system with a streamlined appearance. The fascia is available in white, cream, grey or black. All component parts are enclosed within a sleek cassette system. The fascia is available in white, cream or black or with a matching fabric insert. With blackout and dimout roller blinds the user experiences almost total exclusion or a substantial reduction in light. They are increasingly popular in the home offering increased sun protection, reduction in energy consumption and to enhance the viewing of modern audio visual equipment. Softrise roller blinds are a child safe alternative to the more common chain operated roller blind. The softrise mechanism allow you to raise the blind without it springing up quickly, just release and walk away. 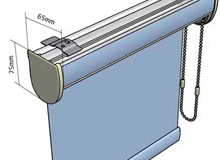 Roller blinds are available motorised with many options available. You can opt for either a handheld remote control or wall mounted controls with built in timers. Timers can control your blinds even when your away. 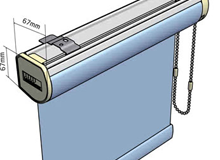 Save time and enjoy life more as your motorised blinds do all the work for you. Depending on your preference, we can recommend the Somfy motor and the control option to suit you requirements. Battery, 24vdc and 240vac power options are all available. Somfy hand held remote control and wall mounted switches and timers. Somfy’s battery powered motors for blinds eliminate the need for wiring. With Somfy’s Sonesse® system, your blinds will operate smoothly and quietly. Set a favourite position and recall it at the touch of a button!